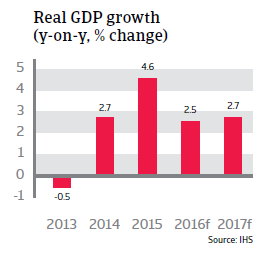 While the economy is expected to slow down after a robust 4.6% in 2015, the forecast GDP growth rates of 2.5% in 2016 and 2.7% in 2017 are still solid. Since January 2014 the Czech Republic is ruled by a centre-left coalition, holding 111 of the 200 seats in parliament. The coalition is led by the leftist Czech Social Democratic Party (CSSD), while the other two parties in the coalition are the centrist ANO 2011 and the Christian Democrats (KDU-CSL). In 2015 the Czech economy recorded a robust 4.6% growth, thanks to higher private consumption, EU-financed public investment and buoyant exports (especially automotive related goods). While growth is expected to slow down in 2016 and 2017, the forecast GDP growth rates of 2.5% and 2.7% respectively are still solid. 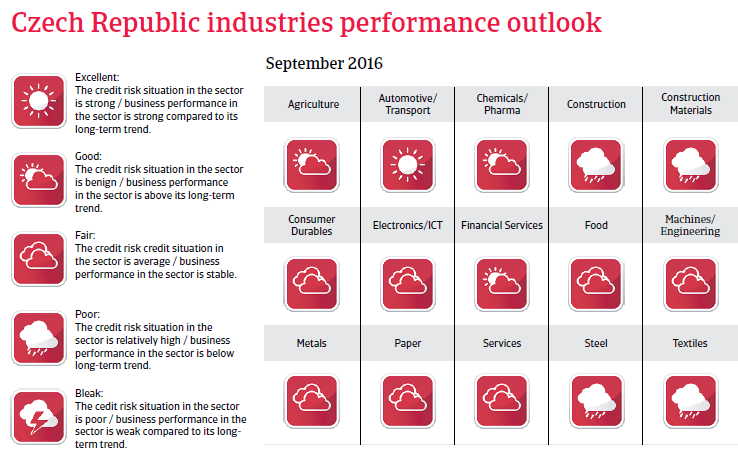 While public investment has decreased, domestic demand is expected to remain robust. Private consumption growth is driven by income growth, decreasing unemployment and favourable lending conditions. At the same time export growth is set to continue, driven by demand from the eurozone and the fact that the country´s international competitiveness has improved. In order to improve the country´s competitiveness and boost exports as well as to contain deflationary pressures, in November 2013 the Central Bank intervened in the currency market by buying euros in order to weaken the koruna against the euro. Since then, it has repeatedly stated it will automatically intervene in order to keep the koruna rate close to a currency ceiling level of 27 per euro, at least until 2017. Inflation is expected to remain low in 2016, at 0.6%, but is forecast to increase above 2% in 2017 due to wage growth and as the effect of lower food and energy prices will fade. 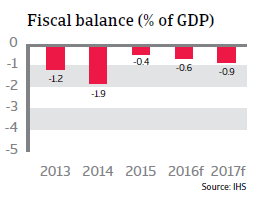 Since 2013 the budget deficit has remained below this threshold and is expected to do so in 2016 (0.6% of GDP) and 2017 (0.9% of GDP). At 41% of GDP government debt is low compared to other countries in the region. The improvement in public finances means that the Czech Republic would have no troubles adhering to the adoption criteria of the euro. However, entering the eurozone still remains a controversial issue in Czech politics. The current account is stable, and expected to reach another surplus of 0.8% of GDP in 2016, followed by a 0.2% of GDP deficit in 2017, as a buoyant domestic market will raise the level of imports. Despite the generally benign outlook for the Czech economy downside risks remain, especially as the rebound in the Eurozone remains fragile. At more than 75%, the Czech Republic’s export-to-GDP ratio is one of the highest in the EU, making it especially vulnerable to foreign trade losses. 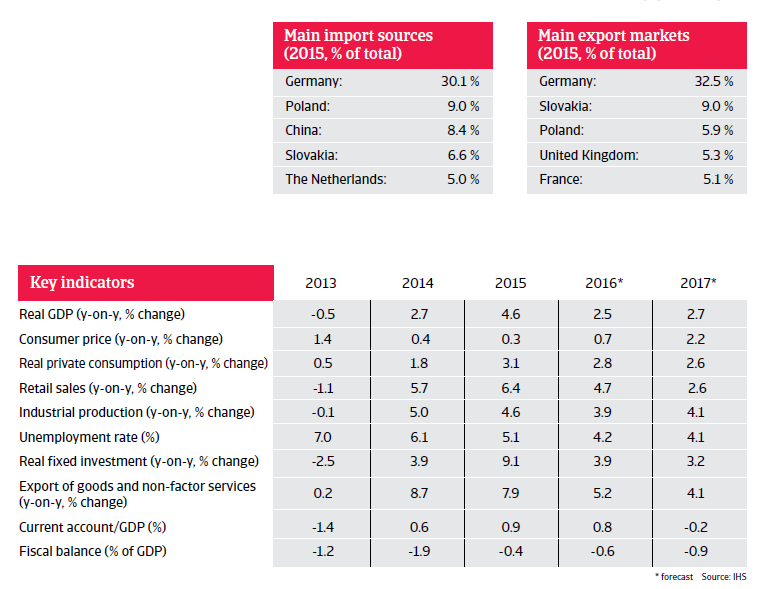 The sector benefits from a robust performance of the Czech economy, but producers dependent on energy/mining and power engineering face difficulties.